2018 was declared the “Year of Perge” and the promotion of the ancient city has been continuing at full speed, while excavations and restoration works persist at the same time. 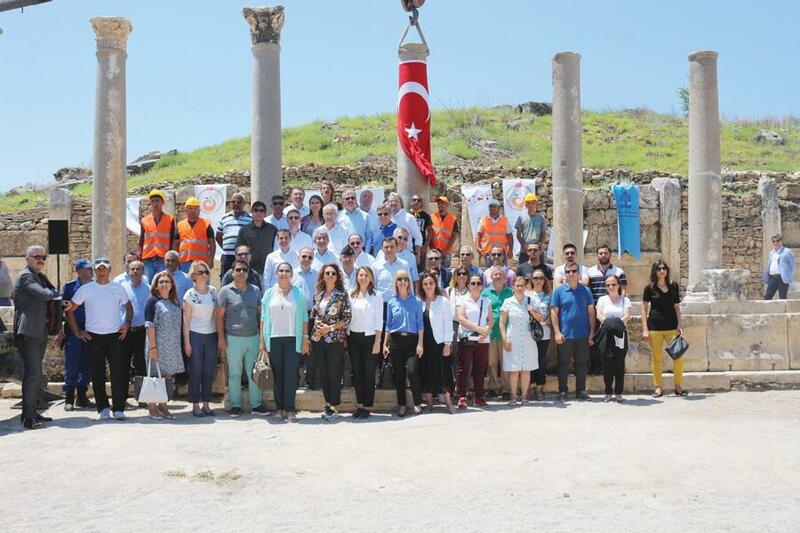 The project, called “Raise Your Ancient Column,” was initiated in April by ATAV President Yeliz Gül Ege. It aims to accelerate the ongoing archaeological excavations and restorations in Perge. As part of the campaign, the columns that were removed during the excavations are now being re-erected on their original street, just as it was in the ancient era, with the help of the sponsors. As part of the project, the number of such columns in Perge rose to 41 with the support of NGOs and tourism professionals, too. Officials from Antalya authorities were also present at the ceremony. Ege dug the first spade into the ground in the area where Perge’s first female mayor Plancia Magna’s mausoleum is located. Plancia Magna was a prominent woman from Anatolia who lived between the first and second centuries in the Roman Empire. Antalya Archeology Museum Director Mustafa Demirel and his team will continue the excavations. Ege recalled in her opening speech that ATAV was established in 1996 and explained the foundation’s activities to promote Antalya. “The Antalya Convention Bureau, under the patronage of ATAV, used Perge as a theme in its yearly meeting catalogue and all exhibition visuals in 2018. Its first appearance was during the Barcelona IBTM exhibition, followed by Istanbul Ace of Mice and recently at the IMEX exhibition in Frankfurt. These activities are followed up with our annual calendar that has been published with different themes for the last 11 years. ATAV’S 2018 calendar theme is ‘Home comers and those still waiting for their return,’” she said. In the calendar, artifacts looted from Antalya and the ones returned to the city were chosen as the topic. “We have a project where visitors arriving at Antalya Airport International Arrivals Terminal will be given questionnaires and asked if they think that ‘historical artifacts are beautiful in their homeland.’ The results will then be sent to UNESCO. Certainly, our main aim is for Perge to be accepted as a UNESCO World Heritage Site,” she added. Another official said that within the scope of the Year of Perge activities, children will visit Perge free of charge and will be accompanied by mentors of the Akdeniz University Department of Counselling during the academic year. Perge was an ancient Anatolian city, once the capital of Pamphylia Secunda. It is now in modern day Turkey’s southern province of Antalya. Today, it is a site of ancient ruins 15 kilometers east of Antalya on the coastal plain. It was an acropolis located there, dating back to the Bronze Age between the rivers Catarrhactes and Cestrus. Alexander the Great, after leaving Phaselis, occupied Perge with a part of his army. The road between these two towns is described as long and difficult. Perge became known for the Temple of Artemis, which is perched on a hill outside the town. The coins of Perge represent both the goddess and her temple. In the first half of the fourth century, during the reign of the Roman Emperor Constantine the Great, Perge became an important center of Christianity. The city retained its status as a Christian center in the fifth and sixth centuries.